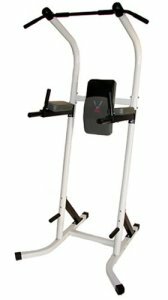 The Body Vision PT600 Power Tower is a multi-workout station that works both your upper and lower body as well as your core. You’ll get a fantastic workout anywhere in your home with this fitness station. The PT600 is designed by Body Max and will strengthen and your body and help you to put on muscle. You can perform a variety of exercises such as pull-ups, dips, leg raises and more. There are multiple grip position so you can find the one that suits you or change up your exercises slightly to work different muscles.